Leyna Ash is a fresh new female sound, with roots that stretch back to Tunisia (she was born in Belgium, lived there between the ages 8 and 18, and then came back). But don't expect pop with oriental influences or raï from her, this is just plain commercial french pop. 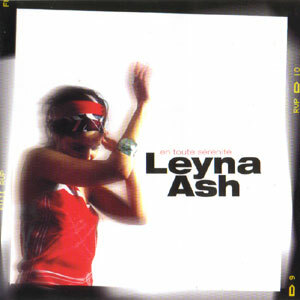 First thing I noticed: compared to the covers of the singles "Laisser Aller" and "Un Peu d'Innocence", the cover of Leyna Ash's debut Cd is rather unattractive. So I include these two singles here, to give you a better understanding of some of the qualities of Leyna ;-). Second thing I noticed: compared to the said two singles, the contents of the CD is rather disappointing. The worst thing of "en toute sérénité" is "en toute sincérité" (in all honesty) a lack of tempo. "A bout du charme", "ultime evidence", "les berges mortes", "heroïne", "M'apprivoiser", it all drags along like languid cats on hot day. There's only the odd glimpse of attractive french pop in between this porridge of chanson, bland rock and weak songs. But "Un Peu d'innocence" and "Laisser Aller" are not bad at all. Of the rest, only "Le Tempo de mon pouls" has something exciting in store. With only two backing musicians and most of the music programmed on soggy synthesizers - the explanation isn't hard to find: the backing sounds sterile, and very cliché. Nowhere there's a sound or beat to be heard that's even remotely surprising. It's as if Leyna is being accompanied by a "band in a box", and has chosen some sort of software program to back her up (even though the musicians in question are Thierry Plas -see Machiavel, Purple Prose- and Kevin Morane). The voice of Leyna Ash is certainly a pleasant one, but it isn't capable of upholding the songs on its own. Seems to me she has enough quality to reach higher than this, but if that'll happen depends strongly on whether she'll find songmaterial of quality to interpret. On her debut album, I didn't find it. Perhaps you do? Alas, I didn't find a single review of this album. Did you see a good (or bad) review? Tell me about it ! You can order this CD from a number of locations (prices researched on September 2, 2001, but nothing guarantees they still are the same when you read this).